Firstime Design Inc. is a fast-growing and profitable reseller of clocks and other home decor items. Firstime sells its products to many leading retailers, including Kohl’s, Bed Bath & Beyond and Kroger. The company is purely a marketing operation; all Firstime products are manufactured by overseas suppliers. Firstime is based in New Berlin, Wisconsin. The firm has a market capitalization of $5.7 million, just in case anyone was wondering whether I had lost my taste for the smallest of the small. Firstime Design has a bumpy history. The current business is the surviving division of the former Middleton Doll Company, which hemorrhaged red ink for years before selling its doll manufacturing operations to a private equity firm in 2010. Middleton Doll was engaged in making and selling creepily realistic infant and child dolls so popular with…..I don’t know whom. After disposing of the doll division and going through further restructuring, the company changed its name to Firstime Design and set about cutting costs and growing sales in its remaining clock and home decor business. Results have been excellent. Quarter after quarter the company has reported record revenues. Since shedding its doll unit in 2010, quarterly sales have more than doubled, and continue to rise. The most recent quarter showed revenues up 11.8% from the previous quarter and up 17.1% from the same quarter a year ago. Cost control has been impressive. 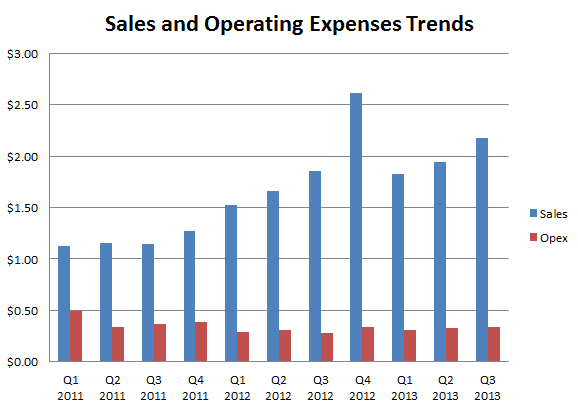 Despite doubling revenues, quarterly operating expenses have held steady and even declined. Healthy sales growth and close attention to costs have resulted in positive operating income since the beginning of 2011. 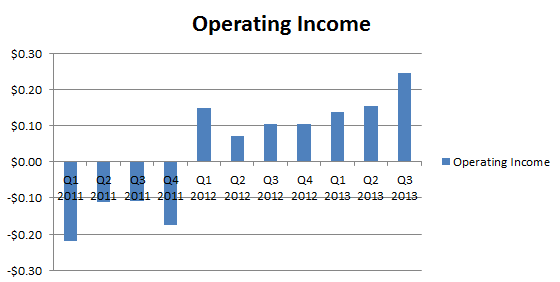 In the most recent quarter, operating income hit a record $0.24 million. Nearly all of Firstime’s operating income drops straight to the bottom line because of a substantial hidden asset: millions in net operating losses built up over time from the failing doll business. These NOLS do not appear on the balance sheet because they have been fully reserved against, but the company’s return to profitability gives the NOLs significant economic value. The gross amount of the net operating losses is listed as $22 million in the 2012 annual report. Some of the NOLs may expire before they can be used, but recent increases in the NOLs from the doll business’s losses should shield Firstime Design from taxation for at least several years to come. Firstime has double-digit revenue growth trends and a clean balance sheet, yet the company trades at a single digit multiple of trailing earnings. These valuation metrics should contract rapidly as revenues and margins continue to grow. Firstime’s valuation is well-supported by its assets. 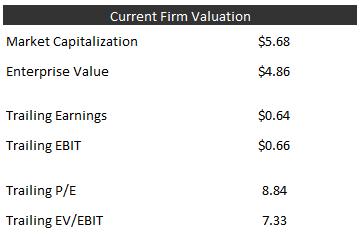 Firstime’s tangible book value per share is $2.66. This book value consists almost entirely of current assets. Net current asset value is only slightly lower at $2.60 per share. Compared to its previous structure as a doll manufacturer, the new Firstime Design is both liquid and conservatively-financed. Firstime is not without its share of risks. As a “middleman” business, there is always a chance that its customers could choose to purchase directly from its suppliers. Firstime’s revenues are also highly concentrated. In 2011, only two customers accounted for 65% of sales. And there is the possibility that FirsTime will mis-judge consumer tastes and find its products languishing on retailer shelves. If FirsTime can succesfully manage these risks and continue to grow its sales and margins quarter after quarter, shareholders could see a nice return as FirsTime’s value grows. Can you please explain how NOL ‘s are reserved against? Thanks. Your writeups would be vastly improved if you gave the share price and shares outstanding every time. I don’t see how. In my view, shares outstanding and price are only important in that they determine a company’s market value. That market value can be compared against the conservatively-determined value of the company’s assets and/or cash flow stream to determine if the company is likely to be under-valued. That is why I always list the company’s market capitalization. I welcome your feedback, but I remain unconvinced that share price and shares outstanding are figures worth noting beyond how they interact to yield market capitalization. Six months from now (or maybe just tomorrow, or this afternoon, if a name pops because you mention it) all of your carefully worked out market value numbers will be stale, and I won’t know how the then-current price relates to the price at the time you did the actual writing. Since you almost always give total numbers rather than per-share numbers I then have to recalculate all of that material myself to see if a name is still statistically attractive and worth the time it will take to dig through the filings. All of this makes it hard to use your site as a quick reference and idea source, which seems to be its highest and best use, so to speak. 2) It would help me figure out, when I read your article (or maybe re-read your article six months from now after the market declines and there are tons of things that I want to look at) how the then-current price relates to the fundamental numbers you give. Market price changes a lot faster than most current fundamental numbers such as EBITDA (and infinitely faster than historical numbers such as 2012 EBITDA). It’s true that shares outstanding can change also, but typically the change is very small. Moreover, I suspect I am hardly the only person who would benefit. Fair enough on some of the points you raise. I suppose things look differently to me as the author. I don’t usually refer back to my own blog for info on companies I have written about. Instead I go back to my source files or spreadsheets. I can see how having that data in the post could be useful to many. I’d like to point out there is also a pretty smart value investor on the Board, Andrew Bass. He’ll know how to monetize the assets. I was surfing net and fortunately went over this site and found amazingly interesting stuff here. Its very charming to scrutinize. I took pleasure in a lot. An obligation of appreciation is all together to share this brilliant information.